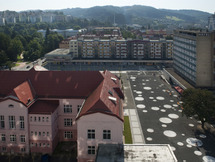 Igor Kovačević and Yvette Vašourková founded the Czech architecture platform MOBA. In the last ten years MOBA has stood at the birth of many research projects both in the Czech Republic and abroad. Moba is an old slavic term for logrolling that is preserved in some parts of Central Europe. In 2001 MOBA founded Centre For Central European Centre - CCEA, the first independent architectural centre in the Czech Republic that deals with architecture on a theoretical and research basis.